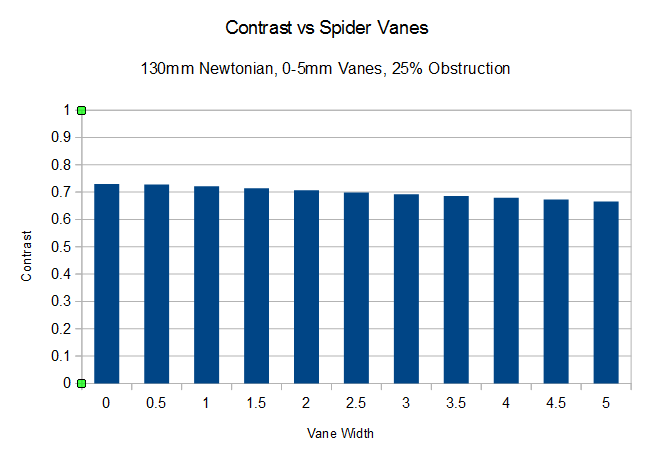 The following animation shows how the diffraction pattern formed by spider vanes changes as the vanes increase in thickness for a Newtonian reflector with aperture of 130mm and a central obstruction of 25% by diameter. The image spans 60 arcseconds, and has been enhanced to show the more faintly illuminated parts of the pattern more clearly (the view in the eyepiece would not be so exaggerated). While most commercial Newtonians will have vanes in the range of 0.5-1.5mm in thickness, the thicker vanes might be encountered in some amateur telescope making projects. The following graph shows the drop in contrast as the vane width increases. Contrast is calculated as the ratio of light in a 1 arcsecond radius circle to that in a radius of 30 arcseconds.